Welcome to the 2014-2015 season! Please post screencaps (or videos), questions or observations, comments, etc here. YAY! Today (Tuesday, October 7, 2014), an eagle flew to the Babysitting tree, coming in from the right and landing on a short branch near the crook branch where Mom likes to sit. 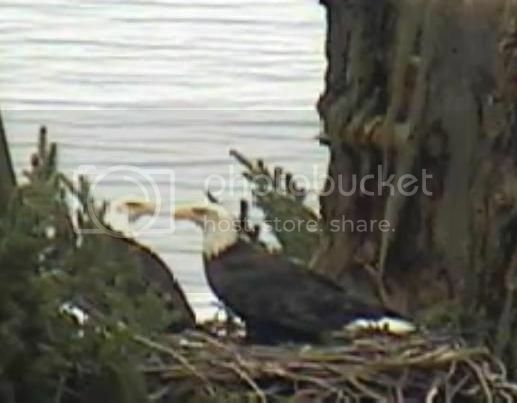 Ground observer Mishi has confirmed that this eagle is ..Dad! Be sure to watch for photos to be posted on the Grounds Obs topic. When did Dad actually return? Do we have a date? thanks. 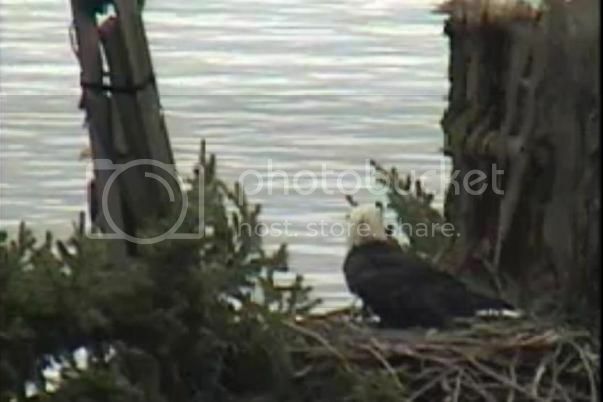 gze, I think the actual date of his return is still being debated (and photos and videos are being reviewed ...) He MIGHT have been on Hornby as early as the 11th, and then kept a low profile until Mom returned. School is still out. But we are all crazy happy to see both of them again, right where they belong. Thanks Nancy - sooo happy to see them and especially to HEAR them both! I've been curious about the timing of their return, if and how it matches up with their later nesting, later fledge, later leaving for salmon runs. Living with very limited internet access for the past several weeks, I've been trying to keep up through the forum, looking forward now to going back and viewing many of the videos I missed. What a joy it must have been to have seen and heard them on the cam ... for sure! Today is a very stormy day on Hornby and the west coast. We may well lose power if these strong gusting winds keep up! But Mom and Dad don't seem too phased. At around 10 AM they visited the nest and were buffeted around for a bit before leaving. Mom's part shows that she's on the left! Mom flies off first, followed by dad a short time later. Mom and Dad were quite vocal today. It was lovely to see them both on the nest when I checked on the cam this morning. Just like old times! These pics were taken between approximately 9:24 AM and 9:30 ish. Mom's part is very noticeable in the pic below - dad hopped onto the CU box to hide behind the struts! Thanks to Paintnut for these two videos. 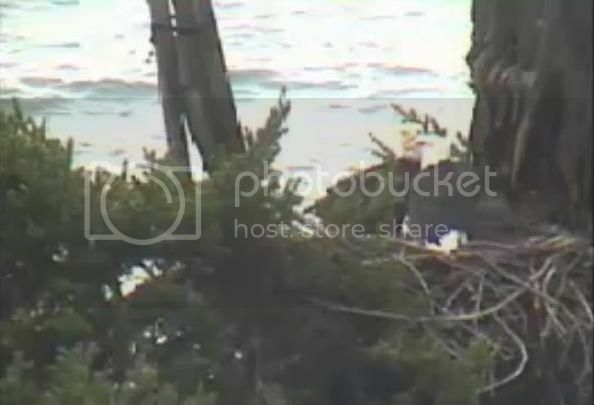 even more exciting, around 12:35, Mom came back to the nest and then Dad arrived, with a stick ... and then he SCOOTCHED for several minutes while Mom watched. Even after he got up and flew off, Mom stayed on the nest. She is still there, nearly an hour later. Nancy, thank you so much for taking the time to give us yesterday's highlights. 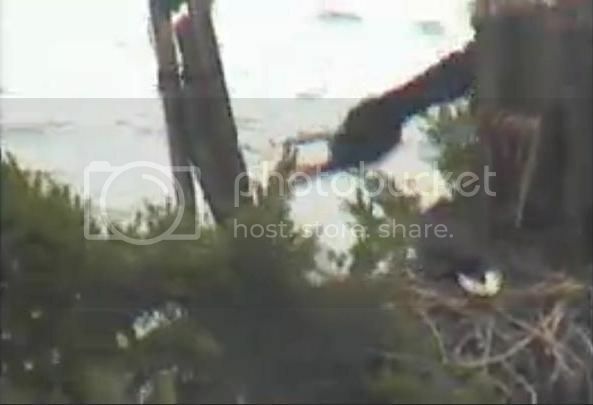 It was quite a stormy day and I'm amazed to see that both eagles were on the nest - and Dad landing a stick that size! Winds were around 30 knots at the time. I would have thought they would just hunker down on a branch somewhere. Last night the winds gusted to 48 knots, as strong as in the pair of storms that downed Booni's backyard perch tree. 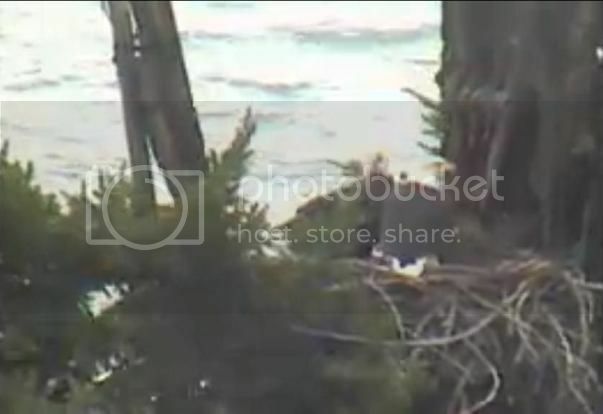 I'm glad to see that once again the nest is undamaged. 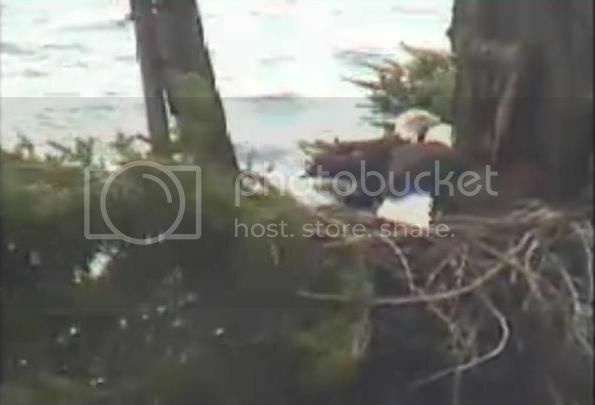 On the evening of March 1, Mom flew off to chase another eagle. She did not return for her usual brief late-night nest visit. When we next saw Mom, her head, face, eyes, and beak had several discolored areas that eventually resolved into areas of injury (rather than clinging food from foraging). 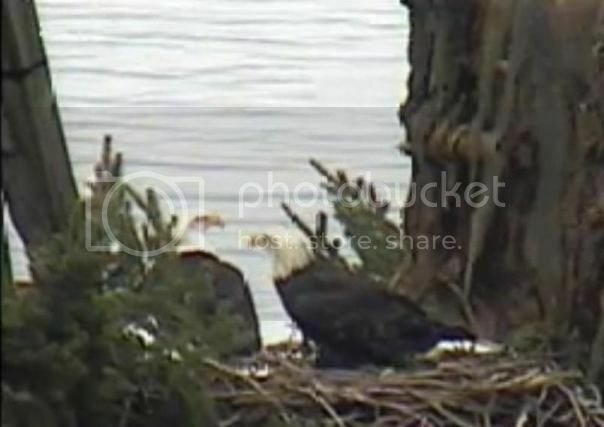 Mom and Dad were seen together on the cam through March 15 and by our ground observer on March 14. Mom has not been heard or seen on cam since March 15. A great number of eagles were in the territory at that time, awaiting herring. Eagles of all ages competed for fish and for good perches. This year, there seemed to be more food competition than usual. There were also a number of new adults, some of whom were vying for Dad's attention. While it appears that many visitors in for the herring spawn may have dispersed, we continue to see some immatures and some young females. At this time (April 2, 2015), we appear to have two or more females (five and six years of age) competing for Dad's attention. We do not know whether Mom has died, has been vanquished, or has removed herself from the fray. 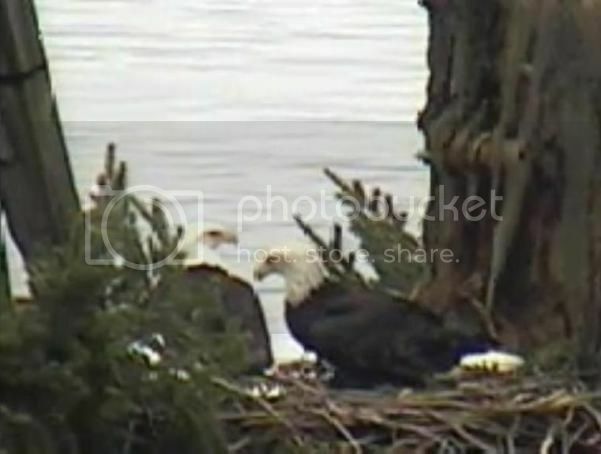 There have been no reports of dead or injured/grounded eagles on the island to date. Dad continues to hold and defend the territory. *Please note that I may have posted the summary, but AJL wrote most of it and booni verified some of the dates - it was a team effort.